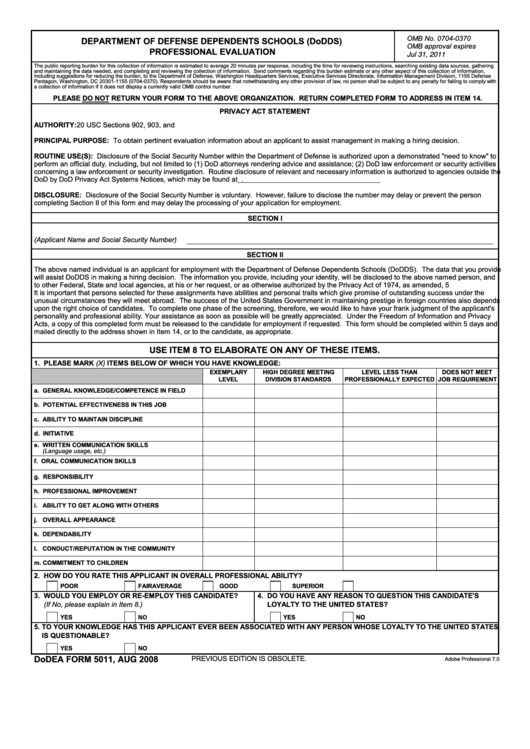 Download a blank fillable Dodea Form 5011 - Dodds Professional Evaluation Form in PDF format just by clicking the "DOWNLOAD PDF" button. Complete Dodea Form 5011 - Dodds Professional Evaluation Form with your personal data - all interactive fields are highlighted in places where you should type, access drop-down lists or select multiple-choice options. a collection of information if it does not display a currently valid OMB control number. PLEASE DO NOT RETURN YOUR FORM TO THE ABOVE ORGANIZATION. RETURN COMPLETED FORM TO ADDRESS IN ITEM 14. AUTHORITY: 20 USC Sections 902, 903, and E.O. 9397. PRINCIPAL PURPOSE: To obtain pertinent evaluation information about an applicant to assist management in making a hiring decision. completing Section II of this form and may delay the processing of your application for employment. to other Federal, State and local agencies, at his or her request, or as otherwise authorized by the Privacy Act of 1974, as amended, 5 U.S.C. 552a. mailed directly to the address shown in Item 14, or to the candidate, as appropriate. USE ITEM 8 TO ELABORATE ON ANY OF THESE ITEMS. 2. HOW DO YOU RATE THIS APPLICANT IN OVERALL PROFESSIONAL ABILITY? 3. WOULD YOU EMPLOY OR RE-EMPLOY THIS CANDIDATE? LOYALTY TO THE UNITED STATES?